The last week has been nothing less than a fairytale for Ekigho Ehiosun, the top striker of high-flying Warri Wolves FC, currently third in the Nigeria Premier League 2010-2011. Last Sunday, on 06.02.2011, Ehiosun scored a magnificent hattrick against Sharks FC in an important league match. This was actually the first hattrick of the current campaign. Last Wednesday, on 09.02.2011, Ehiosun made his full international debut for the Nigeria national football team in a friendly against Sierra Leone in Lagos. Ehiosun came on as a substitute and needed few minutes on the field before he flicked home a beautiful cross from Joel Chukwuma Obi, the Inter Milan talent. The clinical finish secured Ehiosun’s place on the exclusive list of goalscoring debutants at the Nigeria national football team. Based on the above, now seems like a good time to present this exciting prospect from at statisticians point of view. Ekigho Ehiosun is born 12.05.1989 and will therefore turn 22 during the year. This should make him interesting for several “middle-class” European clubs since he is experienced enough to strengthen a team straight away, not having to develop in youth football or reserve sides. Apparently, Ehiosun started his career at Delta United FC, currently named Delta Force FC, a rather unfashionable team from the Delta State in the Southern parts of Nigeria. 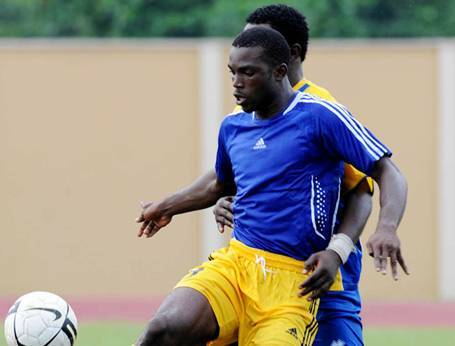 After developing at Delta United FC, Ehiosun made the short trip to Warri Wolves FC, the top club from the Delta State. Ehiosun was part of the Wolves team that won promotion to the Nigeria Premier League after the 2007-2008 season. Ehiosun made his debut in the Nigeria Premier League in 2008-2009 and made an instant impact. According to my statistics, Ehiosun scored 7 goals in his debut season, playing alongside great attacking players like Nosa Igiebor and Anthony Ujah (both currently at Lillestrøm SK, Norway) and Fengor Ogude (currently at Vålerenga IF, Norway). Despite the talents of his teammates, it was Ehiosun who became the club’s top goalscorer. Ehiosun travelled to Norway in January 2009 for a trial period at Stabæk IF. Norwegian newspapers wrote that Ehiosun was 19 years old at the time. Unfortunately, Ehiosun did not impress and he was sent home later that month after making a short substitute appearance in a friendly match against Finnish side FC Honka. On the positive note, Ehiosun was in May 2009, added to the squad of the Nigeria B national football team. As far as I know, this was the first time Ehiosun made any Nigeria national football team. I don’t think he has ever participated for Nigeria U-17, Nigeria U-20 or Nigeria U-23. Nevertheless, he has been training frequently with Nigeria B during the last couple of years. Ehiosun managed to maintain his status as the top goalscorer of Warri Wolves FC in the 2009-2010 season as well, scoring 10 goals during the campaign, one goal more than Ogude. Ehiosun has started the 2010-2011 season brilliantly, scoring 7 goals during the first 14 rounds. This makes him the top goalscorer of the current campaign. Apparently, Ehiosun has played only eight of the matches, which makes the achievement even more impressive. The reason why Ehiosun has only played eight matches is that he has been travelling abroad for trials. He spent some time in Qatar in December / January, training with an unknown team. He was apparently on his way to a new trial period in Vietnam a few weeks ago but decided to stay in Nigeria to participate in sessions with the Nigeria B national football team, hoping for a place in the Nigeria-squad for the Obama Invitational Tournament that hopefully will be played in the United States later this month. At the time of writing, it seems uncertain if the tournament will take place. Last week, Ehiosun was interviewed by MTN Football and stated that he dreamt of playing overseas, preferably in Europe. He expressed a wish to start his career in any of the Scandinavian countries before joining a bigger league. As far as I know, Ehiosun is between 180 and 185 centimeters tall but he is strongly built and has a great physical presence. Ikechukwu Ibenegbu of Heartland FC, one of the best playmakers in the Nigeria Premier League, recently stated that Ehiosun was his favorite strike partner. Ehiosun was described as a “really strong” striker who “bullies defenders” creating space for other players to score. Ehiosun is apparently a qualified petroleum engineer. Nice movement,good returns,fly up man.